Mary Ellen Hannibal is a science writer, journalist, and gifted storyteller. Rewilders will recognize her as the author of Spine of the Continent (2012) in which she described the project of linking protected areas from the Yukon to Mexico that stems largely from the visionary work of Dave Foreman and Michael Soule. In Citizen Scientist, (New York: The Experiment, 2016), she succinctly defines citizen science as “the widening practice of noncredentialled people taking part in scientific endeavors.” Long a participant in citizen science projects in California where she lives, concerned about such threats as global climate change and extinction, she wondered if the volunteer efforts of amateurs like her would really make any difference in addressing such monumental threats. 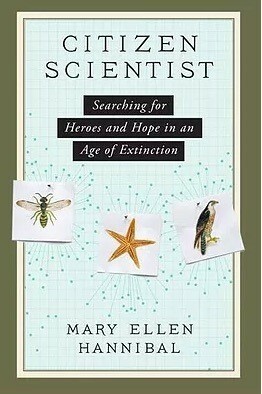 Many conversations with scientists collaborating with “citizen scientists” convinced her that these dedicated amateurs, working with scientists, are cause for hope. Hannibal here offers what she calls a “double narrative,” an inquiry into science and history. Extinction is a word from the realm of science, but it isn’t about science. It’s about history – what happened on the land and in the water, and why. History is based on storytelling, on narratives. The Spanish priests who established the missions here [in California] thought they were creating something – and they were – but they were also destroying something. They told themselves one story but they were living another one at the same time. Two things going on – so it is today. We get in our cars and we go to work, and we work to fulfill ourselves to support ourselves and our families, and on a certain level we think, I am creating. But we are destroying. Hannibal concludes that, more than anything, we need new stories to confront such huge challenges as climate change and extinction, and she finds such stories in the work of citizen scientists. The story that she tells again and again is of innovative credentialed scientists working with teams of citizen volunteers to compile huge data sets that when analyzed with cutting-edge technique and technology, reveal what is happening in time and space. Their work helps us understand what can be done to address big problems. For instance, she notes that “One of the most effective and well-run citizen science projects in the US, Vital Signs, connects researchers who are grappling with the impacts of invasives on land and water with citizens (often students) who essentially do their field work for them.” These citizens are also providing “an early warning system for natural resources managers” who can take action before the problems get out of hand. Another example, in which Hannibal participated, was a three-year project under the direction of vegetation ecologists, to measure grasses, wildflowers, and shrubs in part of the Marin Municipal Water District. The project was formed under the auspices of the Water District and the California Academy of Sciences which had a collection of plant specimens collected on the site over decades between 1890 and 1949, by Alice Eastwood, who was a botanist with no college degree and therefore herself a citizen scientist. The aim was to determine what changes in vegetation might have occurred on a part of Mt. Tamalpais important to the watershed. The results of the citizen team’s work were impressive. There’s a big difference between drawing a circle around a piece of earth and counting up all the species you find in it, and doing that again at a later date, and, alternatively, counting up just the species you find in a certain life stage – budding, blooming, or dying… Williams and Klein designed our surveys to capture these stages of growth, and they set up species lists for us to find. In the three years of the survey, we collected more than 1,137 plants comprising more than 550 species. Adding photographic observations where no plant was collected, those numbers are 2,075 observations and more than 650 species. Logging more than 2600 hours, 185 volunteers helped uncover 93 species not previously known to live on Mt. Tam, including three grasses. Beyond the impressive numbers here is the fact that such a project would have been impossible without volunteer help, and that is a central rationale for citizen science. Projects that involve monitoring over long periods and construction of large sets of data gathered in the field would be prohibitively expensive without citizen science contributions. Hannibal writes that “As the business school adage goes, if you can’t measure it you can’t manage it. And managing vegetation on land sustaining a municipal water supply is important indeed.” Measuring the data to define and address problems in the Marin Municipal Water District required big data, and the citizen scientists impressively helped gather it. This book is chock full of examples of how citizen scientists are contributing today to projects that are gathering data on migrations, responses to climate change, invasive species, the impact of wildfire on natural systems, and many other phenomena that require intensive long-term effort. Such projects always involve trained and credentialed scientists, but the legwork is largely done by volunteers. Hannibal delves into the history of citizen science, including such notables as Thomas Jefferson, Lewis and Clark, Rollo Beck of the California Academy of Sciences, Alice Eastwood, and Ed Ricketts. Aristotle, Leonardo, and Darwin “are trotted out as original ‘citizen scientists,’ and so they are, in the definition of one who explores the world of causality from the perspective of the amateur.” Hannibal also describes institutions, like the California Academy of Sciences, that were instrumental in the history of citizen science. Citizen science as a movement, engaging many people, is a relative recent development but has deep roots. Citizen Scientist is rich in detail about projects in which Hannibal is a participant, revealing how projects such as the Pacific Rocky Intertidal Monitoring Program and Hawkwatch are conducted and how citizens play a part. She provides deep historical background on these and many other projects that include citizen science. She profiles the key players in the stories including both scientists and citizen volunteers. As she participated in projects, she lost her father, which led her to include a personal dimension as she realized how much her citizen science work added to her life. What seem tangents as she describes the emergence of citizen science at the California Academy of Sciences or the contribution of Ed Ricketts always lead to insights about the nature of citizen science. The depth of her reporting results in a lengthy and rewarding read. The recent efflorescence of citizen science is at least in part the result of the ever-increasing ability to analyze large data sets. Hannibal offers many examples of how this is so, profiling scientists who have launched projects, supported by advancing technology, to analyze large-scale changes in nature. Among them are the Breeding Bird Survey, the North American Bird Phenology Program, Frogwatch, eBird, and Hawkwatch. She profiles scientists contributing their technology savvy to projects. One is Rebecca Moore, a computer scientist and expert in bioinformatics who used her technical expertise to help block a logging proposal by the San Jose Water Company. Landing at Google, she led development of Google Earth Outreach and Goggle Earth Engine which are great tools for communities (citizens) to take action against damaging industry proposals like that of the Water Company. 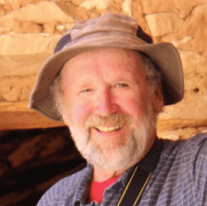 Citizen Scientist is full of exciting examples like this of scientists like Moore and Droege developing tools and approaches that citizens, with a modicum of training, can participate in. The compelling new story presented here is that every concerned citizen can participate in the projects of sustaining and restoring the natural world upon which all depend, not just an elite group of scientists. My first encounter with the idea of citizen science came when I was introduced to the idea of adaptive management. A policy would be developed and implemented to manage forests or wildlife, the results of the policy would be monitored, and the policy would be adapted to improve the likelihood of achieving the management goal. In the 1990s when this approach was being applied, the problem was that there was usually not sufficient money or people to do the monitoring, which was quite labor intensive. One solution to the monitoring challenge might be, some said, to recruit and train volunteers to do this work under the guidance of scientists and managers. The accounts of the many citizen science projects Hannibal describes in this book add up to the new story that citizens can, and must, help understand how the world is changing and what it means for all living things. Hannibal’s approach to telling the story in Citizen Scientist is deeply influenced by the work of writer and mythologist Joseph Campbell who found a pattern in the world’s indigenous stories that he called the hero’s journey. Campbell came to see Myth as “nature talking,” and believed that the hero’s journey is universal and in Hannibal’s words “unites humankind across races, cultures, geography, and time.” The hero’s journey, for Campbell, was “the pathway to personal identity.” She observes that Aldo Leopold, in his classic definition of a land ethic, described what must be a new pathway to citizenship when he called for changing “the role of Homo sapiens from conqueror of the land community to plain member and citizen of it.” Such would be a new and essential Myth, in Campbell’s sense of it, and Hannibal sees citizen science as an important contribution to it. Some people like to call citizen science “participatory research.” This comes out of a decades-long unfolding of thought in the humanities in which researchers began to grapple with the very unpleasant insight that they were treating their subjects as inferior objects, that it is impossible to take a “me expert, you study subject” view that is not condescending, incomplete, and more or less self-serving. With some horror, researchers looked in the mirror and saw themselves reiterating colonial control of indigenous and economically underserved people. A full-on identity crisis ensued. How are we gathering information and creating knowledge, and what are we using it for? Basically, the cure for the dominator approach is to insert the word I into the narrative. We can’t remove bias completely, but we can state our position as honestly as possible, declare our self-interest, our subjectivity. If the researcher is also a subject, and the subject is also a driver of the research project, then maybe we can get some equity here, and “co-create” knowledge. So here is I. Insights like this make Citizen Scientist a book everyone who would rewild at any scale must read.